A QUICK-THINKING Cork baker put the icing on the cake for a Kildare couple after their friends managed to accidentally ruin it just hours before the wedding. That was the horror scenario that faced Keith Gordon from Bray as he stared at the remains of his friends Owen Melia and Abigail Rooney’s wedding cake in the back seat of his car. 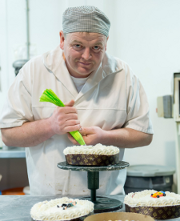 Keith, friends with Owen and Abigail for 15 years, was entrusted with taking the cake from Bray to Inish Beg in West Cork the day before the wedding. They made it to Cork city with the cake intact, but it was the final stretch to Inish Beg that proved to be their undoing. “We picked up another friend in Cork city. We had the cake propped up on a baby seat but the next one and a half hours on the back roads to West Cork was where it went wrong. We were going around a long, winding corner when I heard a scream from the back. However, all was not lost. The friends put their heads together and tracked down Kevin Regan, manager of JJ Fields bakery in Skibbereen. The bakery was closed, but Kevin rose to the occasion nonetheless. “We managed to hunt down Kevin and he rang us back and told us to meet him in Skibbereen. He took a look at it and said it would take about 45 to 50 minutes to patch up. He had a serious amount of work to do. He had to replicate the style of the top part as well as replacing and matching the colour of the cream. And what of the wedding? It went off without any other hitches and the cake story was the centrepiece of the groom’s speech.